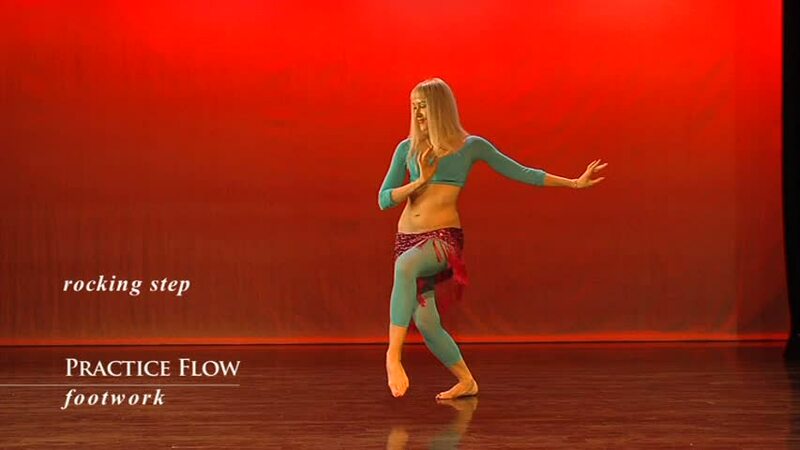 Working with Love Potion: The Bellydance Workout – Day 1, Tutorial – A t i s h e h. Dance. Fitness. Joy. I’m always inspired by the way Mala works systematically with a DVD. I tend not to be like that. I’m more of a butterfly — I see something interesting, I do it once, and then forget it on the shelf for a while. But I wanted to get back into dance, and I wanted to see what it might be like to do the same program, whether a workout, a choreography, or some mixture of both, repeatedly over a few days. Would I notice an improvement? The perfect candidate for this experiment seemed to be Love Potion: The Bellydance Workout. Like other recent offerings from World Dance New York, it has an insane amount of material, a full 140 minutes of it. The DVD case advertises a 50 minute instructional section for beginners, which intersperses guidance on movements with segments of flow, a 5o minute practice flow, and the workout itself, which is 40 minutes long. I thought I’d commit to three days, and do one section on each day, progressing in difficulty as I go. Sounds easy enough, and after watching the intro, I got ready to dance. What I didn’t realise was that the 50 minute instructional section is not actually 50 minutes long. It’s over an hour and a half. I suspect they mean that the instruction itself is 50 minutes long, if you put it all together, but there are enough segments from the flow section that doing the whole thing takes a long, long time. In a way, I’m glad I didn’t know what I was getting into, or I might have been too lazy to start! A couple of observations on this first day: the moves are quite basic, but putting them together in combinations, with footwork, armwork, and all at full speed, is not so basic. It kind of reminds you how much bellydance can do with just a few simple movements. The footwork is covered quickly, but it would be worth learning well. I love, as usual, Neon’s gentle accent and the way she explains the principles behind movements. I also love that she gives pointers on head position and hand accents. This kind of attention to finesse has been a real focus in WDNY videos lately, and it’s most welcome. Also, in her introduction to Love Potion, Neon advises experienced dancers not to skip over slow movements, and she’s right: these are truly difficult to do smoothly. Oh yeah, and I really need to work on my three-quarter shimmies. After an hour and a half, I had to do some serious stretching. I can feel all my abdominal and back muscles (in a good way), to say nothing of my arms and shoulders. At one point during the instruction, my arms were really tired and drooping, and I felt that I must be really out of shape. I now realize this was probably after 80 minutes of keeping my arms up! Neon says in the introduction that this is not meant to be an aerobic workout, but a muscular one. This is truth in advertising — this is probably not the best way to spend your time if your goal is to lose weight, but a great way to practice sharp or gooey movements, footwork, coordination, grace, and musicality. Full disclosure: I received a review copy of this DVD from World Dance New York. Oh yes, Love Potion and her older sister Luscious, are not as basic asut they look. Not at all. I don't find them tiring in the least, but I do find that there are tons of moves I just know in my head and not in my body! The grapewine with a arch back, for example. I just haven't used that, and it's so very usable. Ditto with moves that use semi circles. I just never remember to do those either! I think these two DVDs have a lot to teach, both beginners and intermediates. In fact, you're inspiring me to make some more room after my exercise sessions and get down to these two DVDs. One of which I've pretty much worked with. I hear there are more coming in this series. Really? That's fantastic news, since I think this is a brilliant format, period. I love having a choice of a manageable flow, or of segments I can pick and choose. And, I dunno… I love the whole aesthetic of both videos so far. I even liked the slightly disco music during the practice flow of Love Potion! Hi Irina, love your review! Thanks, Dina! I just realised I never replied to this!